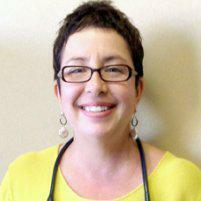 Southwestern Medical Associates Gail R. Goodman, M.D. Gail Goodman is a partner and founding member of Southwestern Medical Associates. She received her BA in Anthropology from University at Buffalo in 1986 and her MD from Sackler School of Medicine at Tel Aviv University in 1991. Her residency in pediatrics was completed at Children’s Hospital of Buffalo, and she has made the Buffalo area her home ever since. Dr. Goodman spent the first seven years of her career as a primary care physician and teacher at Jesse Nash and Towne Garden Clinics on Buffalo’s East side, where she won several teaching awards. In 2000, after the birth of her son, she decided to move into private practice. She joined Drs. Vakante and Whalen on what would be a very successful and unique practice in WNY. She is now proudly well into her “second generation” of patients at SWMA. Dr. Goodman and her family live in Orchard Park, and she loves running into her patients at Wegmans or Chestnut Ridge! She is an avid gardener, loves to cook for family and friends, loves to read, and keeps tearing up all those AARP cards they insist on sending her!